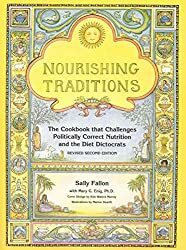 Nourishing Traditions by Sally Fallon is the best cookbook for beginning homesteaders. 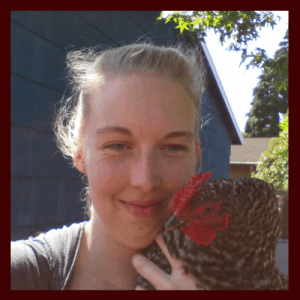 It’s a great way to jump into homesteading even when all you have access to is your own kitchen. You don’t need a yard or any animals at all to start preparing homemade foods! The recipes in this book are for foods that are jam packed with essential nutrients our bodies crave. Start your homesteading journey by adjusting your diet and eat whole, alive, and nutritious foods. The best changes we make in life are the ones that are slow and gradual. If you go from watching cable every night after work while eating take out food, it’s going to be a HUGE shock to move out to the country and start preparing your own food from scratch. The best way to start homesteading is to start eating as if you were growing the food yourself. Get raw dairy and learn how to use it. Make your own sour cream! Learn how to use all the parts of the animal when you eat meat as a part of your meal. Make bone broth with anything that’s left. Changing the way you eat can be hugely stressful! So, it should take you a while to make lasting changes. Nourishing Traditions is a great first step for anyone considering homesteading. Much of Nourishing Traditions is based on research and observations of “undeveloped” cultures. It discusses the benefits of raw foods, including milk and meats, fermenting and soaking grains, and beneficial fats. Pick up a copy and read about the way our bodies have evolved to eat, not the way we’ve been sold based on studies of small sample sizes. After reading it, I started searching for better dairy products, increased our meat consumption (at least during the winter) and started soaking grains and fermenting everything fermentable. I also started reading about the Weston A. Price Foundation, as well as learning about primal and paleo diets, which have a lot of similarities. Once I had those skills under my belt I branched out into raising my own eggs, dairy, and meat. Taking it all on at once would be terribly overwhelming! What Recipes Should I Try First? It’s a big book, and I suggest starting with the fermented grains. Grains are such a huge part of our American diets. Luckily, it’s not difficult to learn how to soak your own. The sourdough recipe is a great place to start, as it details how to create your own starter. Once the starter is bubbling and healthy, there are plenty of recipes to use your sourdough starter. Even if you don’t want to maintain a sourdough starter you can still ferment your grains. We frequently eat soaked pancakes with a homemade raspberry sauce, or soaked oatmeal for breakfast around here and it’s yummy! Don’t be scared by some of the recipes in the book. Just skip the ones that you don’t think you would like. For example, there’s an entire chapter devoted to recipes for organ meats and I just can’t. But if you like your liver, more power to you, you can probably get some good ideas from that chapter! I’ll let the chickens eat my rabbit livers, and get those nutrients in their eggs, thank you very much. This is one book I am glad to have invested money in owning a paper copy. Many pages of mine is marked up with slight alterations to our favorite recipes, a little more water here, a shorter cooking time there, or notes about the kids preferred variations. If I had just used a library copy I would not have fallen in love quite as much as I have when I have the book spread out on the kitchen counter, a dusting of flour across the page. If you’ve thought about eating a more traditional diet and need some more ideas on what to eat, Nourishing Traditions is worth reading. If you think you want to be a homesteader, start cooking and eating as if you already are! 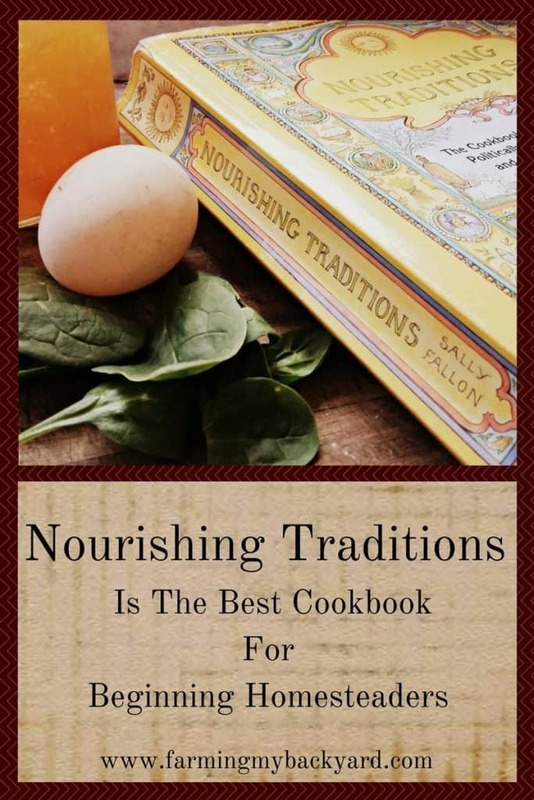 Nourishing Traditions is the cookbook all new homesteaders need to have sitting in their kitchen. I enjoy that book, too. 😉 Have you heard of the website/blog called “Gnowfglins”? Wardeh Harmon has been a great resource for me on our Traditional Food journey. I just got Nourishing Traditions for Christmas, and I’m so excited! I’ve started it, but it’s going to take me a while to get through it. I definitely have some things in my kitchen I need to work on. Even reading the first chapter of this book got me inspired. I took notes on the varying levels of “good” food and it has been a great guideline for me in planning nourishing and nutritious meals all month. Looking forward to cooking more from the book once the garden blooms!